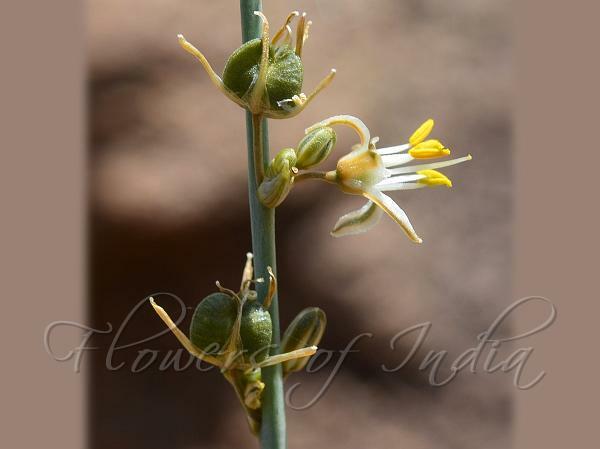 Kolhapur Chlorophytum is a perennial herb with numerous, stalkless, non-tuberous, evenly thickened, fleshy roots, up to 45 cm long, 0.4-0.8 cm thick. Leaves are 6-13, all arising from root, stalkless, imbricating at base; leaf blade 8-40 x 1-3 cm, lanceshaped to lorate or ensiform, slightly sickle shaped, gradually narrowed at tip, chanelled, 14-18-veined, margins hyaline. Flowering stem is usually single, very rarely two, up to 70 cm long, with 2-4 branches, sometimes unbranched, longer than leaves, with 2-4 sterile bracts in the lower unbranched portion, laxly flowered. Flowers are green, 0.8-1.2 cm across, bracteate, flower-stalklate, usually in alternate or opposite clusters of 2-4 flowers. Floral bracts are 0.8-2.8 x 0.2-0.6 cm, green, persistent. Flower-stalks are 0.8-1 cm long, green. Tepals are 6, in two rows of 3 each, divergent and recurved during blooming, outer tepals 7.5 × 1.5 mm, oblique, broadly lanceshaped, 3-nerved, dark green throughout the middle, margins greenish-white. Inner tepals 7.5 × 2.7 mm, elliptic-lanceshaped, 3-nerved, dark green throughout the middle, margins greenish-white. Stamens are 6, 7.5  8 mm long, erect. Capsules are green, triquetrous, 0.3-0.5 x 0.4-0.6 cm, inverted-heart-shaped, papery when dry. Seeds are many, 2-2.3 mm across, discoid, black. 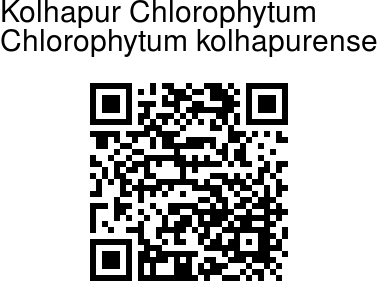 Kolhapur Chlorophytum is rare, sparsely distributed in the dry hilly tracts of Kolhapur distt in Maharashtra and Belgaum and Dharwar districts of Karnataka. Flowering: April-June. Identification credit: Vijayasankar Raman, Sharad Kambale, Anurag Sharma Photographed in Makalidurga, Karnataka.